This is the 3rd part of the gameplay tutorial series focused on turn based grid battles – you can find part 1 here. In this part we’ll set up the battle event for the move command, set grid use ranges and add the move and examine commands to the battle menu. First, we’ll set up the battle event for the grid move command. The event will move the user along a path of cells to the target cell and handle cell events that might be added to them. Since we’re allowing combatants to move over their allies, we’ll need to handle this as well – the easy solution is to disable the colliders and other blocking components on the combatants on the path while the user is moving. Open the ORK Framework editor, navigate to Events and create a new battle event by clicking on New Battle Event. This battle event is also included in the Grid Prefabs, in case you don’t want to set it up yourself. This step is used to check the length of the move command’s path – at the start of our event, we’ll check if there’s any path at all. 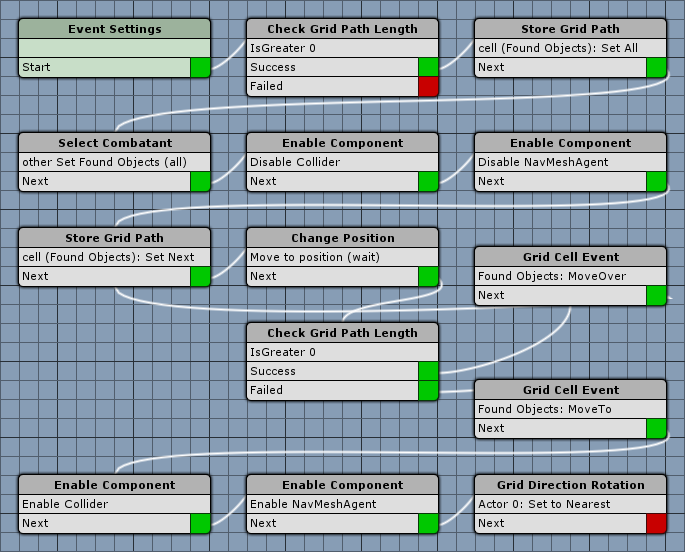 This step is used to store cells of the grid path into found/global objects. We’ll first store the complete path into found objects in order to get all combatants that are on the path. This step is connected to the Success slot of the Check Grid Path Length step. The Object Key is used to identify the stored cells later. The Grid Path Settings define which parts of the path will be used. We want to store the complete path. We don’t want to remove the stored cells from the remaining path, since we still need them for movement later. We’ll use this step to select all combatants that are placed on the cells we just stored. You can learn more about the selected data feature in this how-to. The Selected Key is used to identify the selected combatants later. The Combatant Settings handle which combatants will be used – e.g. you could use the whole group of a combatant. We’ll use the cells we just stored into found objects. We’ll use this step to disable all colliders on the combatants. We’ll use this step to disable all NavMeshAgent components on the combatants. After we’ve disabled the colliders and agents on all combatants along the path, we can start moving the user on the path – for this we’ll get the first cell on the path and remove it from the remaining path. We’ll use this step to move to the cell we just stored. After moving to the cell, we check the length of the remaining path – if there still are cells left on the path, we need to perform the Move Over cell events and move to the next cell, otherwise we need to perform the Move To cell events and continue to the end of the event. This step is used to perform cell events on grid cells. This step is connected to the Success slot of the previous Check Grid Path Length step. The Next slot of this step is connected back to the previous Store Grid Path step – this will create a loop, moving the combatant from cell to cell until the last cell of the path is reached. This step is connected to the Failed slot of the previous Check Grid Path Length step. We’ll use this step to enable all colliders on the combatants. We’ll use this step to enable all NavMeshAgent components on the combatants. We’ll use this last step to rotate the user to the nearest direction on the grid (i.e. look at the cell in front of the user). And that’s it for the event – click on Save Event and save it e.g. 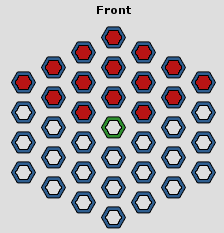 as gridMoveCommand. Next we need to use the battle event we just created for the grid move command, and set the action cost for it to 0 – otherwise a combatant would not be able to move and perform an action in the same turn (unless the combatant has more actions per turn). Navigate to Battle System > Battle Grid Settings and change the following settings in the Move Command settings. Change the settings on the automatically added battle event settings. I.e. the event will only be used if there’s a battle grid. Navigate to Battle System > Turn Based Battles and change the following settings in the Action Settings. That’s it for the move command setup. The use range and affect range of abilities and items has more tactical impact in grid battles. For this, you can define ranges based on cell distances or even set up shapes to be used. We’re going to set up some Battle Range Templates to be used for our grid battles. Navigate to Battle System > Battle Range Templates, there are already some basic range templates set up, but we’re going to add new ones that only define ranges for grid battles. We’ll use this battle range as the default use range for all abilities and items – the range will be 1 cell around the user. Set to Default Grid Range. Set to Grid Range 2. We’ll create a grid shape to only use cells in front of a combatant (in a 90° angle), ranging 3 cells. Set to Grid Frong 3. That’s it for the battle range templates. Next, we’ll put the battle range templates to use – starting with the default use range. Navigate to Battle System > Battle Settings and change the following settings in the Default Use Range. We also need to update the use ranges for some of our abilities – the magic abilities. While the physical attacks are already taken care of through the default use range, we want to use a higher use range for magic abilities like Fire, Water or Boost. Navigate to Status > Abilities and change the following settings. We’ll use Grid Front 3 for these 3 abilities – change the following settings in the Use Range Settings. We’ll just change the Default Range, but you can also define individual use ranges for each battle system. We’ll use Grid Range 2 for these 3 abilities – change the following settings in the Use Range Settings. Finally, we need to update the battle menu to include the Grid Move and Grid Examine commands. Navigate to Battle System > Battle Menus and add 2 new menu items to the Default Battle Menu by clicking on Add Menu Item twice. You can place the menu items where you like using the Move Up and Move Down buttons – I’ve put my Move command at the top of the list (Option 0) and the Examin command below the Defend command (Option 5). And that’s it for now – don’t forget to save the changes by clicking on Save Settings. You can already test the grid battle we’ve set up by now. Open the main menu scene (0 Main Menu) and press play. Move to the location of the grid battle and you can start fighting the enemies on the grid. While you can place your combatant on the grid, move around and attack your enemies, they’re standing still – because we didn’t set up their battle AI yet. You don’t want to walk that far to the battle? Place the Spawn Point near the battle. Also, if you don’t want to go through the main menu scene, you can use Game Starters for quick game testing. The next grid battles tutorial will handle battle AI for grid movement.